Once upon a recent time there was no CPU Website. There was no “Centralians on the Web” forum. There was no CPU-WFA! Then God stirred the heart of a centralian computer enthusiast. And lo and behold, the CPU Website was born. But it was born out of wedlock. I mean, outside the campus, for the campus then was not equipped to give birth to and nurture the website. The CPU administration was not yet convinced of the importance and the urgency of having it then. But this centralian was convinced and he decided to conceive on his own. His “conception” drew some solicited and unsolicited help of a few fellow centralians and friends, and together they developed the concept and put on line the original CPU website, and with it, opened the original “Centralians on the Web” forum without official support and sanction from the university administration. This was hosted for free at the servers of Camp Internet. I learned later that this centralian is no other than Francis. Yes, many of you may not know who Francis is, for he was never Francis to all of us foriks. He is the Fneil –- Francis Neil Jalandoon. And as far as I know, he is the founder of the CPU Website and the “Centralians on Web” forum. Anybody who wants to challenge that will have to present some convincing proof to the contrary. These original site and forum had long been replaced by what we have now, already hosted in our very own servers inside the campus and enjoying the “almost full” support of the university administration. But the spirit that moves behind and inspires the old and the new sites and forums is one and the same— our dear old but never aging Central Spirit. And it is also the same spirit that inspired and sustained the transfer from Fneil and Camp Internet to Rudelskie and the Cyberlib at Henry Luce III Library, and finally to Casel and the UCSC server room where the “prestigious alumni association in the net,” originally the CFA (Certified Forum Addicts) which later evolved to be the CPU-WFA (CPU-World Foriks Association), was born. For non-foriks, “forik” is a word originally coined by forik Tinkerbelle from the words “forum addict”. I tried to browse our forum for some materials to build this history but after hours of wading through the veritable jungle that is our forum, I had to give up because I was always sidetracked to continue reading on a certain topic and forget my original intention of just gathering materials for the making of the CPU-WFA history. I decided I would have to rely on my own recollection and also on some of the things a fellow forik, Peter Ane, PMed (private messaged) me to help me put some spice into this story-telling assignment. As far as I can remember, the CFA, the predecessor of CPU-WFA was informally formed in the first week of June, 2003. The idea just spontaneously cropped up and developed as the veteran foriks from the US, UK, Australia, Canada, Brunei, Saudi Arabia and the Philippines were in the middle of exchanging pleasantries and seemingly senseless and wordless posts. Then on August 26, 2003, Hile Grossmann, the self-proclaimed CFA Ambassadress, together with Sealion, the floating forik, and several other foriks initiated the move to transform the CFA into a global forik association. After several pages of exchanges of posts and replies and hundreds of smilies, the CPU-WFA was finally organized on-line with officers nominated and elected via such exchanges across the globe through the CPU Website forum. The drafting of the organization’s by-laws followed soon after– also done via on-line meetings and discussions through the CPU forum. The very first on-line meetings used to last two to three hours but the diverse time zones and availability of the globally dispersed members demanded that the meeting session be held for three to four days in order to exhaustively discuss the agenda. Despite these limitations, the determination of the officers, particularly the president, coupled with the full support of the members, immediately produced tangible results: a digital camera donation to the UCSC, two scholarship grants for qualified CPU work students starting June 2004, additional hard disk for one of our internet servers, and the book drive for the Central Philippine University Library– all of these accomplished within the first year of the association’s existence. Much as I would like to refrain from mentioning names for fear that I would surely miss some and therefore make them feel forgotten, I also find it difficult to make the story truly a history without mentioning names. For sure no full-blooded forik would contest me when I say that CPU-WFA’s history would not be complete without first mentioning the names of the veterans Nat10977, Excel, Essex, Hile Grossmann, Tinkerbelle, Warcode, DVaflor, Fneil, Toolbyte, Rudelskie, Icebryker, Jorp, Soulrock, Sealion, Froknoy, Styrix, Wanderer, Ngekzmo, Silver Kiss, MauroSomodio, Joyce de la Fontaine, Elich, Teachneer83, Keilah, Blazing Fire, Peter Ane, and many others. 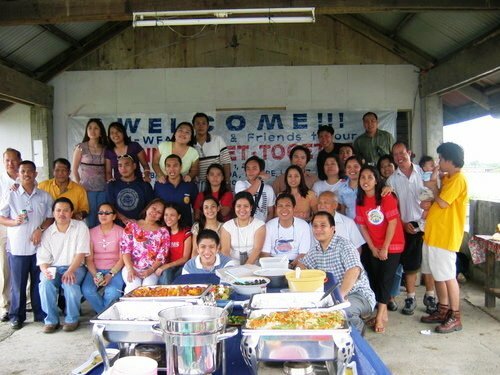 We also have many late-bloomers but are nevertheless as active as the veterans, and some are even more active: Keekay, MauroSomodio, Walalang, Misyo Jr, Soltero, Zilch, Orange, Yellow, Angel, Shawarma, Krunchee, Pandaypulong, Batch86, Jonan Castillon, Zemper, Wyldkard, Cirex, Erie Vibez, Ventricle, Gunfighter, Habagat, Ardjas1, Eyewoman, and still many more. There, I’m sure I’ve already made some feel forgotten. Don’t because your names are all there in the forum and the forum is the complete history in itself. The way I see it, the history of the CPU-WFA cannot be divorced from the history of the whole Centralians on the Web forum itself, and that history that is continually in the making is long, winding, colorful, irritating, inspiring, senseless, sensational, critical, sensitive, relaxing, challenging, interesting, reminiscing, enlightening, and most of all, time consuming! Besides, I do not want to monopolize the history telling myself for I would like that the official history of the CPU-WFA be composed with the help of several other foriks whose talent and skills in the weaving of words are tested and proven and probably more colorful and spicy than what I can muster myself. So, at this point, let me end abruptly, not the official history of the CPU-WFA, but only my version of it. Thank you and good evening! ACKNOWLEDGEMENT: The photos in this post were taken from the CPU-WFA Facebook Group Page. hehe, may mga “flying-thermos” pa da^ sa campus?